Time spent at Pacifica Club in Ixtapa, Mexico is memorable, electrifying, and a bona fide feast for the senses with so many activities to enjoy, combined with fine dining and beach relaxation. Everyone finds delight in activities like bicycle riding, scuba diving, water skiing, fishing and jet skiing. Time spent at Pacifica Club in Ixtapa, Mexico is memorable, electrifying, and a bona fide feast for the senses with so many activities to enjoy, combined with fine dining and beach relaxation. Everyone finds delight in activities like bicycle riding, scuba diving, water skiing, fishing and jet skiing. Daredevils will love opportunities for skydiving and parasailing. The romance of brilliant orange, yellow and red sunsets of Mexico along with some of the freshest, most sumptuous seafood found anywhere is an intoxicating combination. With a timeshare at Pacifica Club, you can choose from Italian, Asian and Mediterranean cuisine, along with delectable seafood delicacies like grilled lobster. Deciding to buy Ixtapa timeshares for sale brings you a host of delights and romantic experiences. Feel soft sand beneath your feet on the beach as you delight in waves softly lapping on the shore. Stroll down the narrow streets of Zihuatanejo for an authentic taste of always fascinating Mexico. In your choice of studio or club timeshare units, you'll find conveniences like mini or partial kitchens with utensils, coffee maker, refrigerator and cooking appliances, along with a safe, iron, and television with cable. The resort features six outdoor pools, six restaurants, gift shop and convenience store, theater, fitness area, travel agency and spa. Learn to dive at the diving school. Have fun experiences with handcrafts, dance lessons, pool snorkeling, theater and games. Nightly resort shows entertain everyone with choices like a Caribbean show, Broadway shows, a special Michael Jackson tribute, along with Balles Folcloricos, Mariachi and Mexican Fiesta entertainment. A cable car circuit ensures that everyone can get around on the resort. 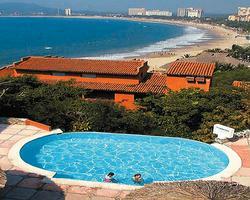 These Ixtapa timeshares for sale give you confidence that everyone will enjoy their getaway. Golf aficionados love the 148 acres of golf opportunities featuring 18 holes of excitement and challenges at Palma Real golf courses, with a backdrop of the spectacular scenery near Pacifica Club Resort. Caddie services, golf carts, tennis courts and paddle courts also add to the sporting fun. Beaches and sports activities combine for a memorable getaway. Contact Pacifica Club Specialist Today!